Peanuts, hot dogs and the smell of freshly cut grass...St. Louis is one of the best places in the country to experience America's pastime. For families with a child in treatment, tickets to Cardinals games are a luxury that many can no longer afford. While Friends gives out as many tickets as it can through its Smile Makers program, this is an event open to each family from every treatment center. Twice a year, Friends gets a section of seats devoted to patients and their families, letting kids see their friends from the treatment center outside of the office, and maybe even make some new ones as well. Being able to experience the incredible atmosphere of Busch Stadium is great, but doing it with your Friends...that's special. 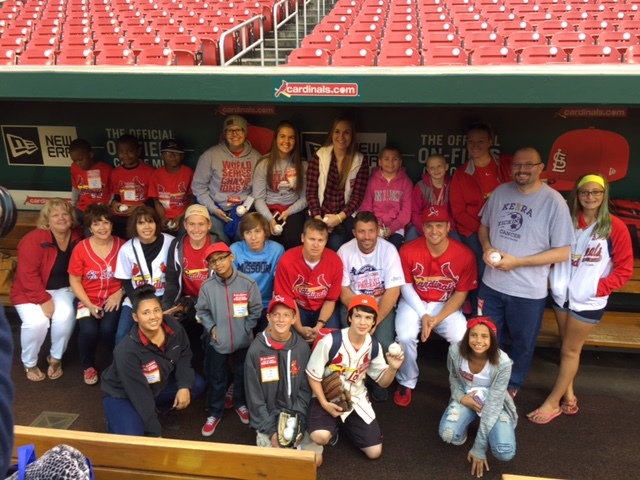 We would also like to thank Tony's Troops for continuing to choose us for their program, allowing so many kids and their families to experience the Cardinals Dugout prior to the game.